Join the 24,900+ others that receive AMAZING recipes in their inbox each day! It's FREE! 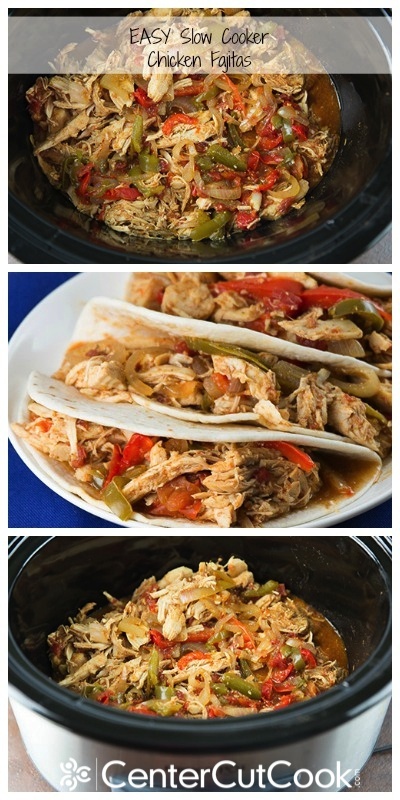 Easy Slow Cooker Chicken Fajitas- 4 ingredient chicken fajitas slow cook in the crock pot all day long to create a satisfying, delicious meal without much effort! If you’ve been following CenterCutCook for any amount of time, you’ve probably already determined that I have a thing for fajitas. My love for fajitas all started when I came across a phenomenal marinade and posted about “The Best Fajitas” I had ever had in my life! My love for fajitas continued to grow when I tried a new recipe for Sizzling Chicken Fajitas that blew my socks off! My fajita love didn’t stop there though…. next I took that recipe and turned it into a not-to-be-missed version of Chicken Fajita Quesadillas. What can I say? I adore fajitas with tender spicy meat and veggies, topped with all of my favorite garnishes. With cooler temperatures right around the corner in Chicago, I began to realize that it’d probably be in my best interest to come up with a way to enjoy fajitas without needing to fire up the grill in sub-zero temperatures. I debated between trying to make them in the oven, or experimenting with my slow cooker. I am always looking for new chicken recipes and ways to use my crock pot, so naturally, I decided my slow cooker would be the best option here! The method is truly simple. Dump everything into the slow cooker, turn it on low, walk away and 8 hours later you have perfectly tender chicken fajitas! Does it get much easier than that? There’s no marinade involved here, instead the meat will get seasoned with a packet of taco seasoning (or make your own – my homemade taco seasoning recipe here) and a can of Ro*Tel which is simply diced tomatoes with green chiles and some seasoning. Right before you’re ready to eat, you’ll remove the chicken from the slow cooker and use two forks to shred it. Once shredded, you’ll return the chicken to the slow cooker and stir it together with the veggies. 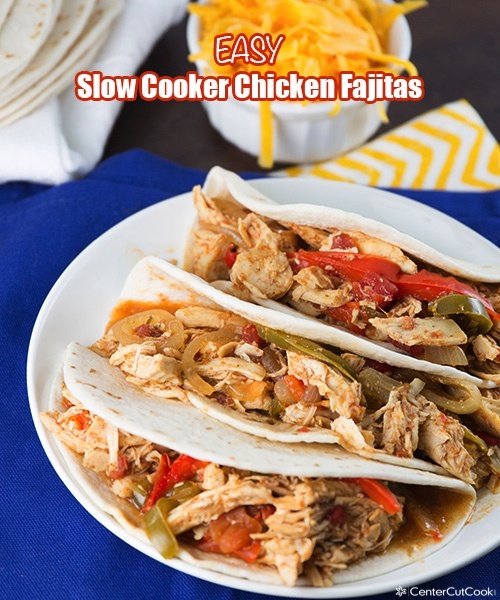 There will be a substantial amount of liquid in the slow cooker, so be sure to use a slotted spoon to serve up the chicken and veggies so that you aren’t left with soggy tortillas. Be sure to top these fajitas with my homemade guacamole and salsa! 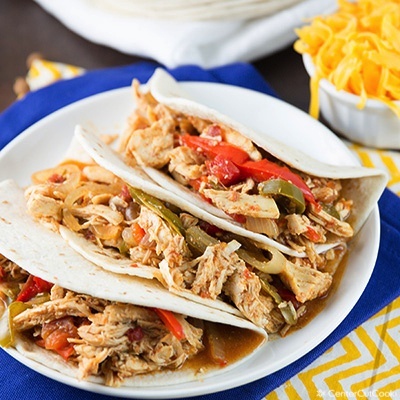 One bite of these tasty Easy Slow Cooker Chicken Fajitas will send you to fajita paradise! Enjoy! Place chicken breast halves (cut each large chicken breast in half length-wise) in the bottom of your slow cooker. Sprinkle 1 packet or 1/4 cup of homemade taco seasoning over the chicken. Top chicken with 1 can Ro*Tel and slices of red bell pepper, green bell pepper, and onions. Cook on low for 7-8 hours or on high for 4 hours until chicken is tender. When the chicken is cooked, remove it from the slow cooker and use two forks to shred the chicken. Return the chicken to the slow cooker and stir to combine. There will be a substantial amount of liquid in the slow cooker, so use a slotted spoon for serving to prevent your tortillas from getting soggy. Place chicken and vegetable mixture on tortillas and top with garnishes of choice.